In organizing the 6th Annual Conference of Comics and Medicine, I frequently heard the refrain “Comics and medicine? What’s that? How do those two things go together?” Indeed, I even heard that comment from the comic book store manager whom I had asked to sell selected books at the conference. The Graphic Medicine Manifesto (2015) is a brilliant response to this question. This collection of essays introduces us to the history, interdisciplinary frameworks and intersections, and vision for the growing fields of Graphic Medicine. In the introductory chapter we are treated to a comic with each of the authors’ avatars who introduce us to Graphic Medicine and the work of the contributors, MK Czerwiec, Ian Williams, Susan Merrill Squier, Michael J. Green, Kimberly R. Myers, and Scott T. Smith. As key figures in the Graphic Medicine community, these health practitioners, humanities scholars, and comics artists represent some of the diversity of thought engaging this field. In an innovative effort to include more voices from the greater Graphic Medicine community, the conclusion features avatars drawn by artists and scholars who also contribute to the conversation. 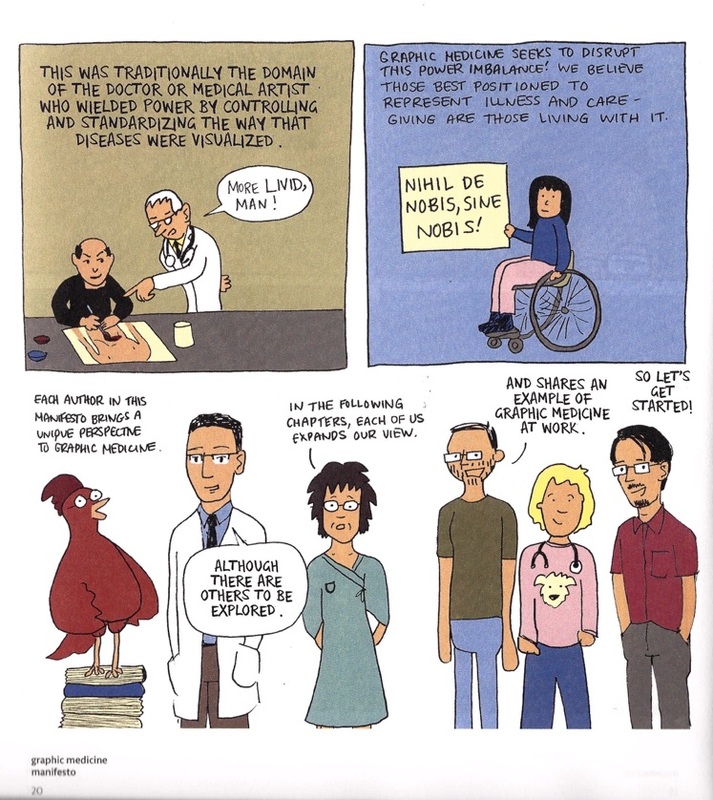 The Graphic Medicine Manifesto is an innovative collection of essays that chart the importance of comics as a field of research, guide us in how to read comics and their iconography, and ask how comics can be used in patient care and in medical education. Primarily situated in the Narrative Medicine conversation (Charon 2008), the essays argue that comics about illness, “pathographies,” generate multiple paths for achieving self-reflexivity and inclusivity. The practices of making and reading pathographies allow readers and creators to shift perspective, to see health, illness, and medical encounters from someone else’s perspective, and to know that there are people out there who share similar experiences of suffering. What is particularly important about the structure of the book and the individual essays is their inclusion of the individual author’s stories, their origin stories about how they came to read and enjoy comics, and then how they took them up as part of their scholarship. Each chapter ends with an interlude where the author shares portions of a comic that impacted their thinking. One could say that it is a moment of reflexive writing, but the goal is more than achieving reflexivity; it is based in a strong commitment for inclusion. Taking the disability studies motto as its lead — “nothing about us, without us” (p20) — inclusivity frames the purpose of their work. Williams and Czerweic, in particular, consider how the combination of image + text in pathographies is creating a sense of serious play (for me this evoked Donna Haraway’s  notion of serious play) wherein individuals narrate and illustrate their knowledge and subjective experiences with an image that is not beholden to biomedical imagery. In an interview with the authors at the Comics and Medicine Conference, Squier and Williams discussed the term Graphic Medicine and the recent debate in Literature and Medicine over the term “medicine” as colonizing and a narrowing of how people experience health. 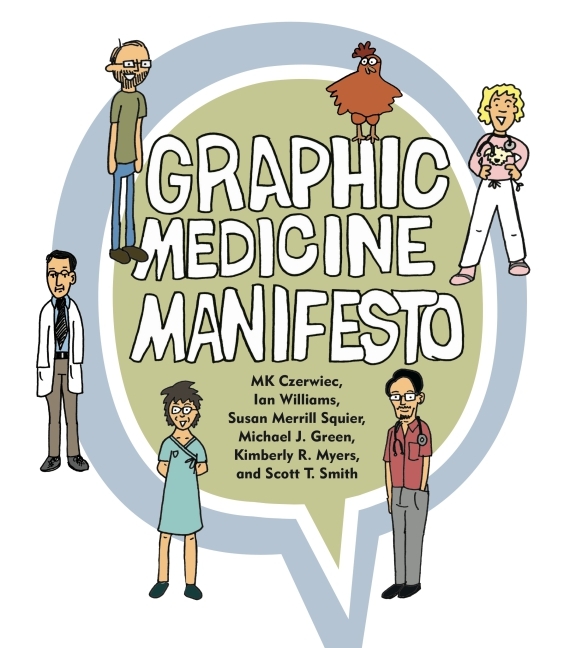 Williams importantly noted that “Graphic Medicine is also a pun, …it’s not just about medicine as in medicine pertaining to doctors, but also medicine given on a spoon, a kind of curative for medicine.” The Graphic Medicine Manifesto, then, is an effort to transform the practice of medicine. Kimberley Meyers’ chapter is particularly adept at examining the interplay between image + text through a discussion of how she incorporates comics into her teaching art and humanities classes for fourth-year medical students. In her course, “Reading and Writing the Patient,” she uses poetry, photography, and comics to engage medical students in ethical practices. Meyers notes that comics, more than the other artistic mediums, provide a productive intersection such that her students feel like they can understand and discuss the material offering both alternative perspectives and interpretive practices for the various images and text in the comic. The ability for medical students to engage multiple perspectives is critical for empathy, good communication, and creativity. Likewise, Green and Czerwiec note that when students themselves draw, the act forces them to slow down, to consider, reflect, and put details together — all skills needed in good patient care, diagnoses, and treatment. A strength of the Manifesto is its descriptions of how authors have used comics in their teaching. Squier, Green, Myers, and Czerwiec all have detailed discussions of how they use pathographies in their teaching and how they engaged those students in drawing their own comics. With the exception of Squier’s chapter, the courses are designed for medical students. The descriptions of the courses and reasoning for why the authors engage the students in specific readings and drawing activities are thoroughly detailed and thus easily adaptable to any student level. The courses all include time for drawing, sharing, and discussion of student work. Green’s chapter provides examples of how students’ creation of comics facilitated more reflection and potential for reflective thinking. Czerwiec’s chapter is an invitation to draw; “The Crayon Revolution” allows us to return to that moment when we stopped drawing in fourth grade and were still using crayons. Drawing for Czerwiec is an antidote for what she calls “narrative constipation,” a condition that healthcare professionals experience wherein they are repeatedly witness to and hear difficult stories with no time for processing the emotions that come with that knowledge. Time and a method are needed to give voice to those stories. For those of us who don’t consider ourselves to be artistic, Squier’s chapter shows us how we can become learners and enhance the work of students when we draw with them. Ultimately teacher and student are transformed. Intersections between Graphic Medicine and key issues in the current comics scholarship literature, as well as other interdisciplinary fields, are addressed in the chapters by Czerwiec, Williams, Smith, and Squier. Smith’s chapter is a review of comics scholarship and provides a grounding for researchers who want to research comics, showing how Graphic Medicine fits into that conversation. Williams’ chapter deals with the representational and iconographic details of making comics. It is a nuanced chapter that provides keen insight into the lives of comics artists and what it means to draw a story of your illness. Williams discusses comics as an embodied practice that, for comics artists drawing detailed, mundane, and intense moments of the illness narrative, access not just the descriptive language of the moment, but also pushes us to consider concerns about the artists’ embodiment. Czerwiec’s chapter provides citations for some of the research being done around comics, including studies that demonstrate the impact of comics on patient lives and on health systems. As comics play a greater role in understanding illness and medical encounters, this chapter sets the groundwork for future work in the area. I particularly appreciated Squier’s chapter for her thinking about the interdisciplinary conversations Graphic Medicine could have with fields outside of medicine such as disability studies, gender and sexuality studies, and science and technology studies. Overall this is an excellent interdisciplinary text that provides an engaging introduction into Graphic Medicine along with some points of departure, such as moving beyond focusing only on the doctor/patient relationship and into broad discussions of embodiment, representation, care and caregivers, and showing how drawing can enhance critical thinking and transform biomedical thinking. As an anthropologist I am always asking myself how our discipline can contribute to this conversation. Anthropology has a long history of attending to narratives in general and illness narratives in particular (Kleinman 1989). Illness narratives allow for the inclusion of subjective experience of medical encounters and the context in which the encounters occur. So what is added by considering comics and comic-making not just as a medium to be analyzed for its representations? In what ways are the instantiated images of suffering more than an analytical object? The authors of the Manifesto argue that in slowing down to consider and draw the details of an encounter, emotion, or experience, comics enhance our visual language, enhance reflection, shift perspective, connect people through their stories during some of the most anguishing moments of life, and transform the practice of medicine. For anthropologists these ideas could take the form of embodiment, biosociality, or a host of theoretical concepts. Moving beyond the linking of theory across conversations, we can return to the authors recurring point about inclusion. Notably, Smith mentions that the majority of collections written about comics — books that lay the groundwork for the historical and theoretical work in comics scholarship — were written by comics artists and enthusiasts. The critical conversations did not come from academics who viewed comics as analytical objects, but rather from the people who created and actively engaged the medium. Where does this critique come from in the humanities or social sciences? Can we use comics, the combination of text and image, to create opportunities for inclusion of other perspectives? The previous post in this blog series on the Image as Method Symposium offers some important insights on how to orient our thinking toward putting different things together. The Graphic Medicine Manifesto could be used to consider methodologies and collaborations that actually allow us to put in conversation diverse ways of seeing, speaking about, and experiencing bodily suffering. One of the contributions that anthropology could make to this conversation is by adding to the diversity of comics discourse. To return to Haraway’s thinking about serious play, these comics are both imagination and material reality and as such hold the possibility of transformation. Anthropology’s expertise in the study of power and the potential of the Otherwise (Povinelli 2011) could be marshaled into decentering by drawing the details of ethnographic observations, details of relations between people and objects, and narratives that are not offered in comic form. Anthropologists’ collaborations across the globe and in conditions where biomedicine is not the dominant method for care would greatly enhance the inclusivity that the Graphic Medicine community seeks to engage. Charon, Rita. 2008. Narrative Medicine; Honoring the Stories of Illness. Oxford: Oxford University Press. Haraway, Donna. 1991. A Cyborg Manifesto: Science, Technology and Socialist-Feminism In the Late Twentieth Century. In Simians, Cyborgs and Women: The Reinvention of Nature. New York: Routledge. Kleinman, Arthur. 1989. The Illness Narratives: Suffering, Healing, and the Human Condition. New York: Basic Books. McMullin J. Graphic Medicine Manifesto. Somatosphere. 2015. Available at: http://somatosphere.net/2015/graphic-medicine-manifesto.html/. Accessed April 24, 2019. McMullin, Juliet. 2015. Graphic Medicine Manifesto. Somatosphere. http://somatosphere.net/2015/graphic-medicine-manifesto.html/ (accessed April 24, 2019).